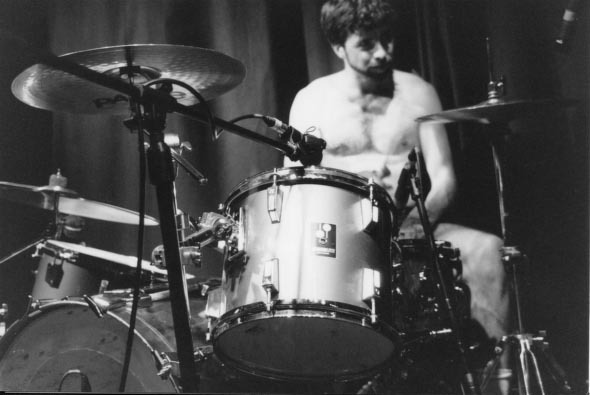 Michael Dahlquist, shirtless and hammering away at his drums. Ten years ago today, I was ten days into a teaching post at the University of Canterbury in New Zealand. I had just shaken off the jet lag that comes from moving to a time zone 16 hours ahead and had gotten into the routine of checking messages from the States and watching the national news over breakfast before heading into the office. Michael Dahlquist was 39; his friends and coworkers were Doug Meis (29) and John Glick (35). He had been Silkworm’s drummer for 15 years. Silkworm was a rare band, at the same time deeply accomplished (Andy Cohen was and is one of the most effectively virtuosic guitarists alive, and former member Joel Phelps is my candidate for most talented musician of the past 30 years) and down to earth. After a period of heavy touring, each of the three remaining members after Joel’s departure settled in Chicago, where Andy had decided to attend the University of Chicago’s law school. All fit recording and touring into their jobs and routines; Michael, John, and Doug were on their lunch break from Shure in Skokie when they were killed. Before their deaths, it seemed Silkworm’s work-music balance and dedication would carry the band long into the future. That was taken away ten years ago. As was a delightful person. I didn’t know Michael well (I’d moved from Chicago to Pittsburgh years before he relocated from Seattle), but I looked forward to seeing Silkworm come to Pittsburgh and when I did see him, he always seemed interested in whichever person he was speaking with. He was also hilarious, evidenced by the tour journal he kept between 1997 and 2005. That journal gives a little evidence to the sweat he’d work up as he hit his drums as hard as anyone I have ever witnessed. Michael regularly taped his sticks into gardening gloves to play. Michael’s death ended Silkworm. Tim and Andy regrouped into the quartet Bottomless Pit (see this post for an appreciation of that band) and provided beautiful tributes to Michael on their first album Hammer of the Gods (itself a name used to describe a similarly hard-hitting drummer who died too young). Steve Albini wrote a moving obituary for Michael in the Chicago Reader (link opens pdf). In the years since, a lovely documentary gave visual and audio evidence of what Michael was like. The Silkworm website became an archive and discussants their migrated to the forum associated with Albini’s Electrical Audio studio. There, conversations morphed into a terrific Silkworm tribute album An Idiot To Not Appreciate Your Time which captured the spirit of the band through the lens of 29 fans and friends. That spirit also lives on in the PRF BBQ festivals held in Chicago and everywhere from San Francisco to New York to my onetime stomping grounds of Michigan’s Upper Peninsula. Jon Solomon reminded me of the anniversary with his open letter to Michael today. I saw Jon last month at the annual Chicago BBQ, and his letter reflects my feelings about that event, and how what has been built relates to Michael’s example and why we miss Michael ten years later. This entry was posted in history on July 14, 2015 by Carl Zimring.